Per default, if nothing else is defined, the initial containing block is your document's root element (the html element). This means all offset or positioning values will be calculated respecting the boundaries of this element. This would result in something you can see on the following picture. Otherwise, you can view it live looking at Example 1. You can verify this by firing up Example 2 in Internet Explorer. It would render a visible border on any textured backgrounds. You won't be able to "stick" the three columns directly to the headmast, cause there would always be a one pixel dividing line between it. In my case both points were to disregard. Fine, I thought, just to discover the next flaw within minutes. Woe! I tried to add a floated image to the #content div. It didn't show up. I just caught a glimpse of it when reloading the page but it vanished within milliseconds. Believe it or not, the image was rendered beneath the content div and therefore covered by the background color of it. See Example 4 using IE6. After some desperate efforts to make it work, this let me drop the whole thing, coming up with a fixed height headmast and appropriate calculated top offsets for the absolute positioned elements. Not at all satisfying. I am quite sure all of these points are widely known, but it was something new for me, so I felt the need of writing it down! Use a conditional comment for IE to apply the top border to #main. That way only IE gets the border, since only IE needs it! So you can keep your styles inside a linked stylesheets. Thanks for the pointer anyway, Dante. 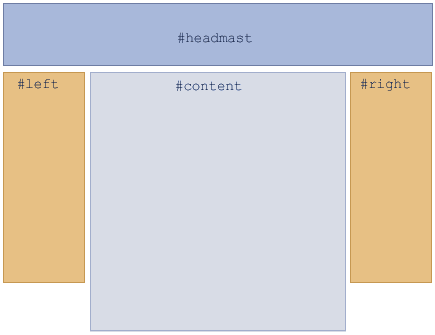 One of the most valuable lessons I learned regarding CSS-positioning is that you can have an absolutely positioned element inside a relative container - this opens up all sorts of possibilities. BTW thanks for checking out my redesign yesterday, I think it should all be fixed now.